1. The hydraulic fluid exerts equal pressure everywhere in its circuit. For this reason equal braking effort is obtained at all the four wheels. 2. This is simple in construction, due to the absence of brake rods. It used pipelines to transfer fluid which can be bent and shaped according to the underside of the body structure. 3. Due to absence of joints compared to mechanical brakes, rate of wear is also less. The main component of hydraulic braking system is master cylinder, which contains reservoir for the brake fluid. Master cylinder is operated by the brake pedal and is further connected to the wheel cylinders in each wheel through steel pipe lines. This system is so designed that even when the brakes are in the released position, a small pressure of 50kPa is maintained in the pipe line to ensure that the cups of the wheel cylinder are kept expanded. 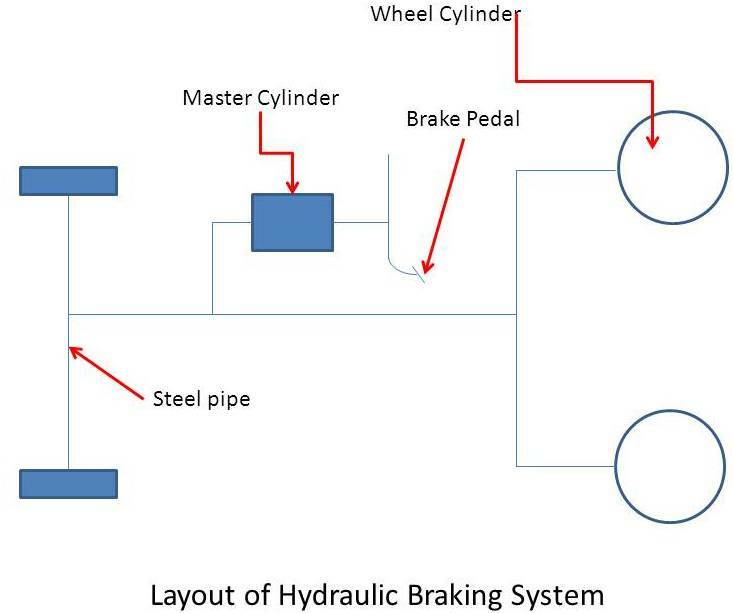 As we discussed in my last post that all braking system work on the friction principle so it also used drum or disk brake to slow down the vehicle but the force is exerted by the hydraulic oil so named as the hydraulic braking. The master cylinder is basically a piston cylinder device contain fluid. When the pedal is pressed, push rod moves the piston inside the cylinder which builds up a pressure. Due to this pressure hydraulic fluid is forced into the pipes under pressure. This fluid enters the wheels where a small piston cylinder arrangement known as caliper. This high pressure oil push this piston pads towards drum or disk thereby applying the brakes. The main component of this braking system is the master cylinder. The working and design of master cylinder is as follow. This can be named as heart of the hydraulic braking system. There are two chambers. The upper one is known as fluid reservoir and the lower one is known as compression chamber in which the piston operates. The fluid in the reservoir compensates for any change in the fluid volume in the pipelines due to temperature variation and due to leakage. There are rubber seal on both ends of the piston. A rubber boot covers the push rod end of the master cylinder to prevent the dirt from entering inside. At the brake lines side of the compression chamber, there is a fluid check valve with a rubber cup inside. It serves to retain the residual pressure in the brake lines even when the brakes are released. Two holes connect the reservoir to the compression chamber. The smaller one is known as bypass and second hole is known as intake port. The push rod is operated by the foot brake pedal. As the pedal is pressed, push rod moves the piston left against the force of the spring, till it covers the by-pass port. Further movement of the push rod causes building up of pressure in the compression chamber. Finally, when sufficient pressure has built up, the inner rubber cup of the fluid check valve deflected, forcing the fluid under pressure in the lines. This fluid enters the wheel applying brakes. Today we have discussed about hydraulic brake system. If you have any query ask by commenting. If you like this article, don’t forget to share it on social networks. Subscribe our website for more informative articles. Thanks for reading it. what is the need of bypass port in reservoir?